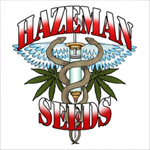 Hazemans Seeds began breeding in early 2000. They started just making seeds for other breeders before they decided to open their own seed Company. They wanted to give good genetics for a good price, so everyone has the chance to grow good strains. They like old school stains - indica mostly. The name Hazeman was chosen because one of the first strain they played around with was Haze. They have been messing around with growing since the late 70\'s and they wont stop until the day they die.